Glenna's husband Don Hertzler is a Sackett Family Association member. Member 2003–8, 2009–13, 2015–; Secretary 2011–13. Salt Lake City 2004; Boston 2006; Fort Wayne 2007; Vancouver WA 2010, Fort Wayne 2015. Glenna’s mother-in-law, Viola Sackett Hertzler, sparked her interest in family history. Viola always had on a shelf above her dining room door, a goldfish bowl filled with pieces of old newspaper articles. Viola had inherited the bowl from her father Joe (Josiah Andrew) Sackett. About ten years ago on a visit to Colorado, Viola allowed Glenna and Don to “take down” the goldfish bowl and look through the pieces. A letter dated 1839 from a mother (Lucinda Sackett) to her son (James) was among the pieces. The newspaper bits became old family obituaries. No one remembered who any of the “newspaper” people were and thus the puzzle began. 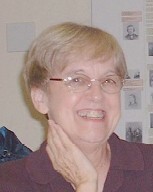 Glenna practiced as a Registered Dietitian in western Oklahoma for almost forty years. She and Don have two daughters and four grandchildren. Family camping trips are a favorite part of their family stories. In addition to finding family connections Glenna enjoys reading, hiking and visits with family.